The “King’s Villa”, or “the Royal Lodge”, as it is called today, is the private property of the King and Queen. It is situated on Voksenkollen, a hill on the outskirts of Oslo. The lodge has mainly been used during the winter; the Royal Family celebrates Christmas here and spends a week at the lodge in connection with the annual ski-jumping contest at nearby Holmenkollen. In the last few years it has been used in spring and autumn as well. After the election of their king in 1905, the Norwegian people wished to make a coronation gift to the new King and Queen. A committee was appointed and funds were collected. But what form should the gift take? Norwegian tradition held that the king should have a royal farm, but this time he already had one. It was decided to build the Royal couple a house in a contemporary style, and by 1910 the new villa was ready for use. The announcement generated enormous interest, and designs were submitted by 69 architects, more than half the total number of architects in Norway. Two of them were chosen as winners and purchased: the first prize went to Kristian Hjalmar Biong and the second to Arnstein Arneberg and Ole Sverre. The Royal Lodge is a two-storey house built of logs with notched corners and incorporating motifs used in traditional Norwegian farmhouse architecture. With its covered verandas, projecting eaves and roof of sod, the building is a blend of palace, farm and medieval castle. 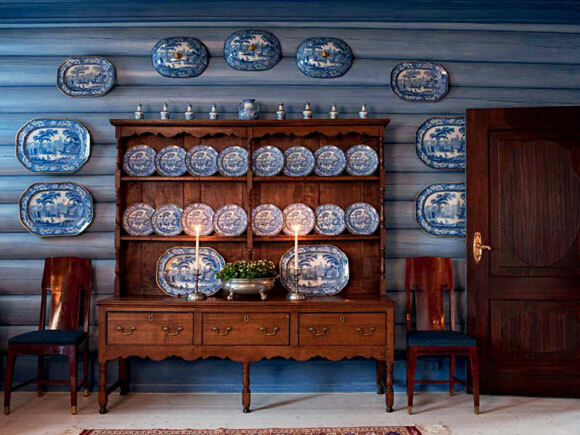 The style is also reminiscent of Norwegian Neo-Baroque. This is particularly evident in the gable wall, which is decorated with a symmetric pattern of plant ornamentation in rich colours, inspired by Norwegian 18th-century woodcarving traditions. There is also an element of the organic nature of art nouveau in the bevelled edges of the wall apertures and the style of the windows. The logs are visible in the inside walls, and the rooms have richly painted and carved decorations.